Climate CoLab is an online community of over 75,000 people, where people work together to develop proposals for how to address climate change. In its fourth year, Crowds & Climate conference was a chance to connect with leaders from businesses, non-profit organizations, governments and communities around the world. Attendees joined us to hear and engage with innovative climate solutions, and advance a new, collective way of tackling climate change. Janos Pasztor, Senior Advisor to the United Nations Secretary-General on Climate Change and Senior Fellow at the Carnegie Council for Ethics in International Affairs joined us as a keynote speaker. Attendees met and mingled with Climate CoLab winners and other innovation leaders at Crowds & Climate. Attendees of Crowds & Climate had the opportunity to stay for HUBweek, Boston's weeklong celebration of innovation & creativity, September 25 - October 1. You can still participate by following @ClimateCoLab on Facebook and Twitter for all the latest information about the winners. Share your thoughts about the conference, using the hashtag #mitcc16. 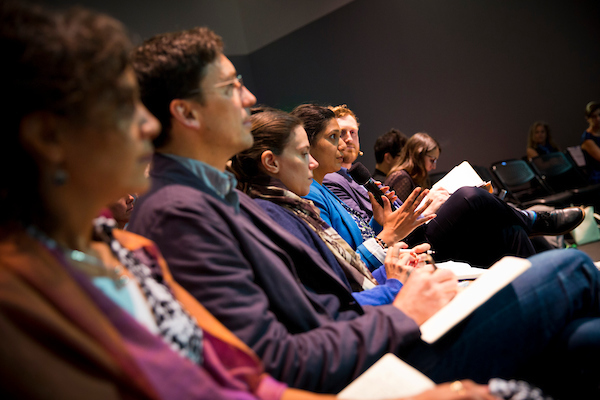 The conference was aligned with MIT's Solve, whose mission is to discover, evaluate, and advance solutions to big, global problems; and was a part of HUBweek, a week-long city-wide festival celebrating ideas and innovation in the Boston area hosted by MIT, Harvard University, the Boston Globe, and Mass General Hospital.